79. Draft of Canto IV. 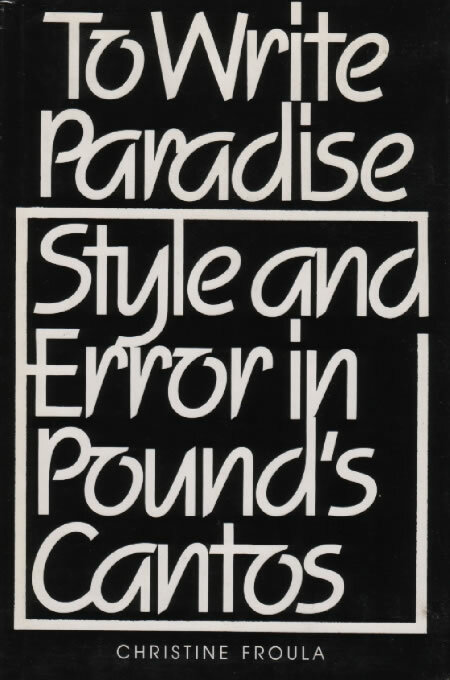 In To Write Paradise: Style and Error in Pound’s Cantos, by Christine Froula. New Haven: Yale UP, 1984. Froula’s work includes a reproduction not of the earliest manuscript version of a fourth canto, but of a second text based on it. She notes that the earliest draft of the text reproduced here was typed on the versos of announcements of Itô’s program of dancing of 28 October and 2 and 9 December 1915 (see 26). This version of the canto includes a section titled ‘The Modern World’ (pp. 73ff.) that in its opening lines includes numerous references to Japanese subjects, some of them too obscure to trace. Pound contrasts the stateliness and ‘deliberate ceremony’ of classical Japan (ll. 90-93) with modern European ‘sacrilege’, and laments that these ‘long courtesies’ are ‘Going at last, [as] Japan turns european’ (l. 94). He refers (ll. 76-83) to ‘Pere Henri Jacques’, a French Jesuit (see 59, p. 180) who according to internal evidence in the lines lived for a time at a hermitage in East Asia, and to a man Pound knows who had visited the place. Froula’s note suggests plausibly that this man would have been Kume (Ap) or Itô (Ap), both of whom in any case Pound would have had in mind in reference to the ‘Plain, manufactured, “well taught” orientals, / talking of Emerson and Hoffmansthal / Cezanne and Nietzsche / And women’s quarters, with ancient ceremonies’ in lines 86-89. Sen-sei (l. 76): Japanese for ‘teacher’; Sennin (l. 77): Japanese transliteration of the Chinese hsin-jen, ‘hermit’ or ‘philosopher’; summit of Rok-ko (l. 77): not a reference to Mt. Rokko near Kobe but instead a Japanese transliteration of the Chinese ‘Taihoku’, the name of a sacred mountain in Kankyo Province, Korea; Banker of Japan (l. 82): obscure. References to Pere Henri Jacques, ‘Rokku’, and the sennin remain in later versions of canto IV, but in passing and without reference to the contextual material included here.